This is what fans of Peter Jackson's The Lord of the Rings have been waiting for, this amazing Blu-ray trilogy collection which not only presents the three movies in glorious 1080p HD Widescreen but there are a plethora of amazing special features included as well. For now, this is the bees knees of The Lord of the Rings that even comes with a digital copy of the movies to enjoy them on other formats as opposed to justBlu-ray. As all three movies were filmed back to back, the first movie was released in 2001 that faithfully recreated the detailed fantasy books of J. R. R. Tolkien as an epic battle between good versus raged. The Lord of the Rings novels were also the precursor to the fantasy genre or more specifically, the sword and sorcery genre which was sometimes plagued by cheesecake. Thankfully Jackson returned this genre to a more serious undertone, however deciding what to cull for the big screen was the challenge. Although recreating the novels were indeed a monumentous task for Jackson as not only was the director a fan of Tolkien but attempting to recreate the world of Middle Earth and the setting of the stories would require Jackson's special effects company to push current special effects technology beyond what is possible but somehow they achieved the unimaginable which still looks amazing today. Even though The Lord of the Rings movies have been available on Blu-ray, this is the first time they have been collected that more importantly hosts the engaging special features and this is definitely the highlight of this current release but before we get to these exciting goodies, let's have a quick recap of the stories. The first film highlights the importance of the central characters in the film which, especially Frodo, a hobbit who accidentally falls prey to an ancient and mystical ring that the Dark Lord Sauron requires to fully rule the lands of Middle Earth. Fortunately Frodo has the assistance of a powerful magician named Gandalf the Grey (Ian McKellen) who creates a fellowship of warriors to assist the young hobbit in destroying the ring within the fires of Mount Doom where the it was created. 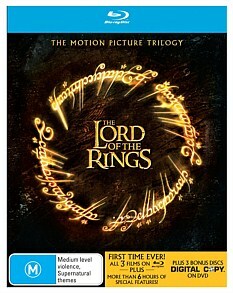 The first film in the trilogy is quite powerful to watch from the majestic cinematography of New Zealand which mimics the lands of Middle Earth to the amazing special effects that actually look real, The Fellowship of the Ring was truly a wondrous journey that really comes to life on Blu-ray. 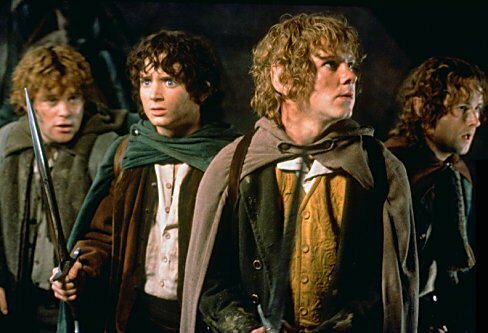 There are quite a few suspenseful moments in this film such as when Frodo, Samwise "Sam" Gamgee (Sean Astin), Peregrin "Pippin" Took (Billy Boyd, and Meriadoc "Merry" Brandybuck (Dominic Monaghan) are hiding from the Black Riders of Sauron. A true Hollywood moment. Or the twist that Strider (Viggo Mortensen), a ranger who is sent to assist the hobbits reach Rivendell is actually of noble blood and is called Aragon. Whether its the noble elf Legolas (Orlando Bloom) or the powerful dwarven warrior Gimli (John Rhys-Davies), characterisation and "race" plays a huge role in this movie which the actors nail on the head perfectly. Not to mention the special effects department as they turn human actors into hobbits and dwarfs. It's quite a technological feat. Having read the novels, there are some artistic liberties taken into consideration for the first film but given the timeframe of the film, some things had to be cut unfortunately. It's definitely a great way to start the series. The Fellowship has been broken. Boromir (Sean Bean) is dead, Frodo Baggins (Elijah Wood) and Samwise Gamgee (Sean Astin) have gone to Mordor alone to destroy the One Ring, Merry (Dominic Monaghan) and Pippin (Billy Boyd) have been captured by the Uruk-hai, and Aragorn (Viggo Mortensen), Legolas (Orlando Bloom), and Gimli (John Rhys-Davies) have made friends of the Rohan, a race of humans that are in the path of the upcoming war, led by its aging king, Théoden (Bernard Hill). From the cliff hanger ending from the first film that has seen the fellowship torn asunder, The Lord of the Rings: The Two Towers explores more of the world and politics of Middle Earth. Led by Gollem (Andy Serkis), hobbits Frodo and Sam are getting closer to the wastelands of Mordor but we discover the effects of what happens when you wear The One Ring, too much, thanks to Gollum, a twisted and insanely jealous Hobbit who was once the wearer of the ring. Serkis plays this split-personality character quite well which makes it unsure for the viewer if he is actually helping himself or that of the greater good of Middle Earth. The second story also highlights the scope of the upcoming battle and there is a fantastic scene with Saruman (Christopher Lee), a magician now working for Sauron who had Merry and Pippin abducted. 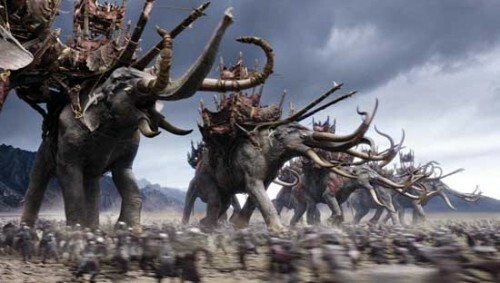 Seeing the scope of the armies of Sauron is quite frightening and even though those who have read the book know how it will pan out, seeing it as a visual representation is all so more riveting. The second film really upped the ante of the series. The final movie, The Return of the King transforms quite a few of the characters such as Frodo, Gollum, Aragon, Legolas and the return of Gandalf the White. Even though the battles of The Lord of the Rings are a treat to watch, I commend Peter Jackson who successfully tyed all lose ends of the story and when the dusts of war settle in Middle Earth, the viewer is treated to some excellent closings for the majority of the main characters such as the crowning of Aragon or Frodo returning to his humble town. The third film is easily the best of the trilogy from the epic battles and great storytelling of Jackson. The special effects have also been upped in the final film and you can really see the differences in special effects between all three movies. The highlight of the film is the destruction of Sauron's army and that of the Ring by the valiant hobbits. It nicely cements the fact that this is the best sword and sorcery film even created and is a must have purchase for any Blu-ray collection. With a stellar cast of actors, both from Australia, New Zealand the rest of the world such as Viggo Mortensen, Liv Tyler, Ian McKellen and Hugo Weaving, The Lord of the Rings trilogy proved that this genre could be made for the bigger market as opposed to the sometimes clichéd sword and sorcery movies. There have been some criticisms of the film, including the length of the movies but from a professional point of view, Peter Jackson's The Lord of the Ring trilogy is a cinematic masterpiece that actually makes you care for the characters, thanks to an invisible emotional tie between the characters, actors and the viewer. Video quality looks amazing on Blu-ray, thanks to its 1080p widescreen presentation that boasts exceptional image quality, vibrant colours and special effects that still look quite real. The DTS-HD Master Audio 6.1 track on all three films is thoroughly impressive and gives your surround sound speakers a true workout. The dialogue is crystal clear and the musical score truly booms to compliment the story. It's great hearing the sounds of battle around you, especially the battle at Helm's Deep... wow! This release contains a plethora of special features from original trailers, music videos and more importantly, some great behind the scenes documentaries on the creation of this Academy Award winning movie. It's great being given an insider's tour of how these three movies were made and the dedication involved by cast and crew. Finally, this release contains the digital copies of the movies which means you can view them on other formats to ensure that The Lord of the Rings is never out of reach.